Many forms of therapy, both physically or otherwise have evolved over the years, and core work and spine alignment are a constant topic these days. People have been seeing chiropractors for decades, who adjust skeletal and muscular compositions within your body to ease tension and realign structure. Ever since the beginning of the technological revolution, the population of the world has been fiendishly trying to get “the thing they get or experience out in the world” to be something commercially available in their own homes. Something that has spurred the technical, and manufacturing industries into a speedy evolution. Inversion tables provide one of those things. A method of physical therapy generally only found in a chiropractor or physicians office, inversion therapy uses the lovely inevitability of gravity to release the tension in your spinal discs, as well as release some tension in your muscular structure. We — spending our lives standing up straight — take a beating from gravity over the years, which is why is often feels very great to lay down flat, and remove the pressures of the spinning planet versus the magnetism of the Earth’s core. Inversion Tables have the ability to flip you upside down, giving owners that in-home therapy once limited to doctor visits. The working people of the world are going to rejoice, cry out, and sigh with relief (in that order) when they invest in this inversion table. Inversion tables are a tried and true back relief method. It only makes sense that they be paired with massage and heating, two things that are also tried and true back pain relievers. Health Gear knows their health, which is why healing is the name of this product’s game. By helping your back with this inversion table, you’re going to be happier and healthier worker and human. Such a glorious invention for many reasons, the heating pad has had a long history of success in treating pain. This time around, the heating pad has been integrated into this inversion table. However, you don’t need to be using the table to get the warm and toasty results. You can detach the heating and massage pad for use at your desk, on the couch, and even lying in bed. This adds a level of versatility to the product that’s not common in other inversion tables. This alliteration is more than just cute; it’s incredibly accurate. The extra-long locking lever (or “arm” as the product calls it) preserves the pain relief you’ve just experienced. This extra long arm is the arm that doesn’t require you to bend over to grab it. For such an essential component of the inversion table, this is a fantastic feature. Now you’ll be able to unlock your ankles without ruining all that nice relaxation you’ve just experienced. This list is certainly starting off with a high quality inversion table. While the price may be a little out of range for some, we believe that it’s actually a great bargain. Not only are you getting this inversion table, but you’re also getting the heating and massage pad. By making the pad removable they’ve managed to create a way to make this an inversion table that you can even use at the office. Or at least, a part of it is. If you want a tried-and-true, versatile inversion table, this is the product for you. The best way to relieve back pain is to intervene early. By taking care of your back early on in life you’ll be more able to enjoy the later moments in your life. This inversion table is professional grade, and has received some of the best reviews on the list. If the idea of spending this much money on a product makes you balk (which we’ll go through later on in this entry), don’t skip reading about its benefits. This is truly a tool of physical therapy that will help with certain back conditions, which can easily and accessible be ordered from the comfort of your home. While many inversion tables call themselves adjustable, this is the only table that’s really and truly changeable. The height of these tables makes a huge difference, as many of them can be hard to control and uncomfortable if they’re not fit right for your body. The Teeter adjusts by inches, rather than ranges. This means that instead of setting the table for “6 foot to 6 foot 5” range, you can set it for your exact 6’1” height. This can make a world of difference to your back, as well as to your ultimate goal of healing. One reviewer described it as being “like floating on air”. While we haven’t tried it, we’re inclined to agree. This table is lightweight and flexible while still being able to carry your full weight. While oftentimes this would mean that the table would look clunky and bulky, or lack on actual support, this table has a sleek, mature look. This inversion table is quite literally the picture of health. The blue is a dark enough shade that it could be considered a neutral, which means it won’t look terrible sitting in the corner of your computer room or home office. Support and flexibility? Yes please. The Teeter is the best table Amazon can offer, but the price really does reflect it. 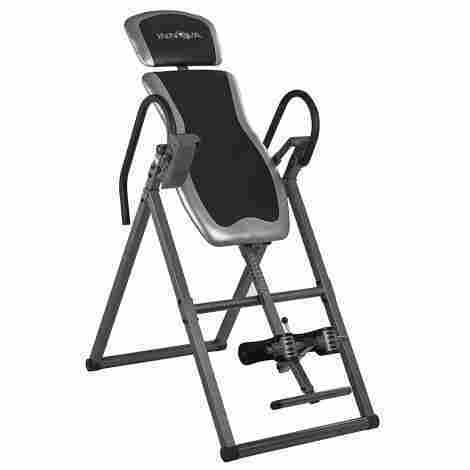 This piece of equipment is for those who are looking for something that’s comparable to a medical-grade inversion table. The specificity of the height settings, the sleek look and feel, and the comfortable, durable ankle locks make this table truly one of a kind. It’s worth the price tag. IRONMAN is back with another brilliant inversion table. This Gravity 1000 model is all you need to defy gravity, and we’re sure you’ll be able to fly free thanks to the number this table does on your spine. This inversion table is a little more unique compared to others, as the back is made of a material that’s not exactly a flat board. The Nylon stretch is comfortable, which makes this IRONMAN your next back pain relief hero. We know, we know: there’s a whole section dedicated to cost and value. However, we believe this inversion table needs its own section regarding affordability, because it’s such a big hurdle. For those that medically need this therapy in order to improve their life, having a table that’s available on the cheap is essential. This table does just that. It gives IRONMAN level quality while also offering a cheap price. This makes the table a hugely appealing prospect, as it doesn’t cost you an arm and a leg. The height is one thing that many people have issues with when purchasing inversion tables. For those tall people, they have huge difficulty finding things in this average-sized world that fit them. Pants are too short, sleeves not long enough, and inversion tables just don’t stretch as long as they need them to. That’s changed with this product, which allows for those 6’6” to get the stretch their backs need. This is definitely one of the cheapest inversion tables on our list, but we don’t mind. The value that you get for this cost is far and away one of the better ones at this price. Because you’re buying from a reputable company, you can rest easy that this product is going to fit their high standards. Other than missing out on the bells and whistles, there isn’t a lot of disappointment that will come with this inversion table. We believe that massage is a wonderful thing. Whoever invented massage needs to be given a pat on the back; massage has saved our bodies from excruciating pain, tension, and stiffness, and it can save yours too. This inversion therapy table is a great choice for someone who wants a little something extra in their table. The write-up about the product boasts that it’s highly advanced, which we think we have to agree with. 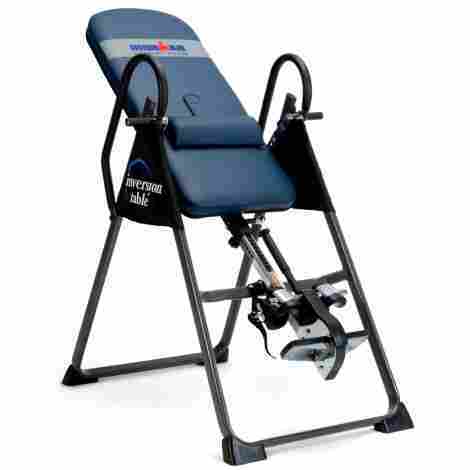 Based on the reviews and product specs, this is indeed an advanced inversion therapy table. Many inversion tables offer adjustability for different heights. Some offer a range, and some offer it on an inch-by-inch basis. Innova believes that you need more than a single adjustment, however. Your body is complex, which is why you often need to give it a lot of attention. The adjustable head rest means that you can balance on this table a little easier, and it won’t shift due to a faulty balancing of your center of gravity. The best part? The bottom is still adjustable for height, making this a truly unique product. The massage capabilities on this table are amazing. They say that their vertical massage system is unique, and can provide a closer massage to the lower back and full spine. The heated aspect makes it easy for muscles to relax and release tension, which adds to the benefit of the massage system. The vertical system really does get your whole spine, making it as simple as pressing a button to receive amazing back care. This machine is pretty much going to give you the value of its cost. While the price is comparable to the last inversion table we discussed, the quality is much higher. While it certainly lacks the home gym component, we believe that it makes up for that in heated massage. At the end of the day (literally), which one would you want more? Need a superhero to save your back? Look no further than IRONMAN. This company has designed this inversion table with your back pain in mind. This inversion table is sturdy, strong, and doesn’t waste time on bells and whistles. It gets the job done, and isn’t afraid to tell you what’s up. Spoiler alert: it’s not you, because you’re going to be too busy flipping upside down on this inversion table. Oftentimes these products don’t allow those who weigh more than 300 lbs to use their products. The weight capacity can only go so far, after all, before things start to bed and break. We now believe that this isn’t totally accurate, as this inversion table boasts an impressive 350 lbs maximum weight load. Whether it’s due to construction or confidence, we’re not really sure. All we know is that we believe it’s great for those larger souls who want back pain relief as well. Small apartment dwellers, your wishes have been granted. This inversion table is foldable, which means it’s able to tuck up and away onto shelves, loft storage spaces, and even under very high couches. The way that this inversion table works is just like any other: you lock in, lean, and go. The only difference is the hinging, which is what makes it possible to fit this inversion table into your tiny space. 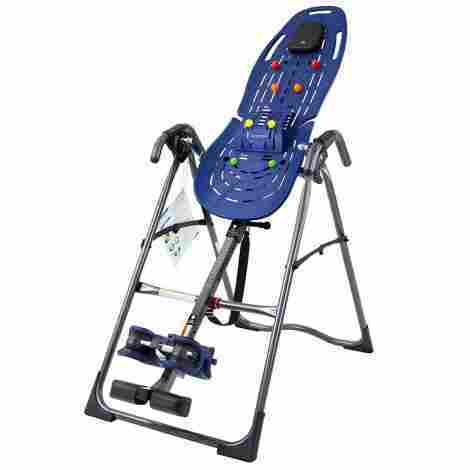 This inversion table is worth it but might not suit your personal preferences. If you’re looking for a basic inversion table, this is it. When you can get something with extras (like massage and heating) at a similar cost, we wonder if you’d be better off getting one of those. However, we know that not everyone wants fluff and fancy. That’s why this table is on here. It’s a sturdy, compact inversion table suitable for even the most frugal and bare personality. 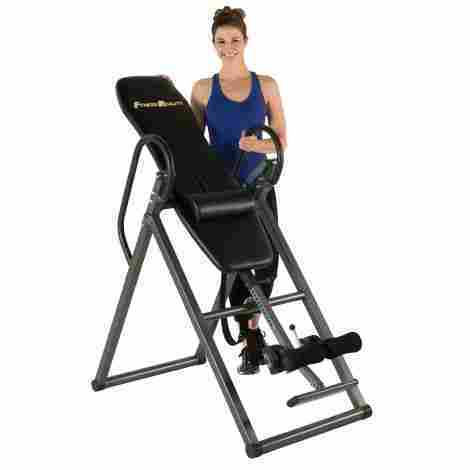 This inversion table has the word trainer in the title, which might make it seem like a weak product to some. However, in this case “trainer” simply means “safe”. The benefits of this table are similar to the benefits of non-trainer inversion tables. The regular inversion tables incline you, allowing your spine and back muscles to stretch to their heart’s content. This is a great table for both seasoned inverters and those in training alike. Remember when we said it was safe? We really do mean safe. This inversion table provides not only the support and stretch that a free-floating table does, but it also allows you to stay in your comfort zone with no hassle. Kettler Apollo has a maximum angle setting. This maximum means you can’t accidentally flip further than you meant to, and you won’t end up scrambling to try and get back up. Believe it or not, this does make a difference. While you might think that straight handles are going to be easier to hold on to when you’re 45-degrees from vertical, they actually have the opposite effect. By curving the handles, this table gives you support all the way down and all the way up. Curved handles are easy to hold on to and make it possible to come up a little more gently. This table is truly one of the most expensive on the list. 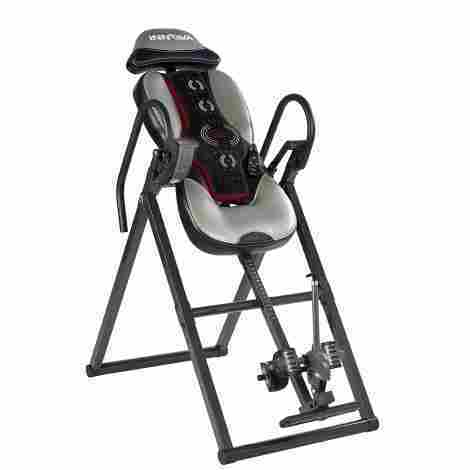 At $400, this is comparable to the Teeter inversion table. While that one is often touted as one of the top tables, this one is relatively unknown. While everyone knows the Teeter, not everyone has exclusively good things to say about it; the same is true of any product, right? Not in the case of the Kettler Apollo table. All the reviews are positive, and this inversion table has a perfect 5-star rating. If you’re willing to spend the money, you likely won’t be disappointed. It might feel like taking a bit of a chance, though, as it’s certainly not as well known as the Teeter. Are you safe? Are you sure? You can be now with the SURELOCK safety ratchet system. EXERPEUTIC truly has your well-being at the forefront of their choices with this inversion table. Their safety is second to none, and the table itself has received rave reviews from beginners and pro-flippers alike. Plus, no pinching on the ankles? It’s a dream come true. The most common complaint about inversion tables are the uncomfortable ankle supports. It’s a fair thing to complain about. Many of us aren't used to hanging our full body weight off of our ankles. It’s not a normal position for the human body to be in. Other inversion tables might not be sensitive to that fact, as their ankle straps pinch, press, and tug at the skin. 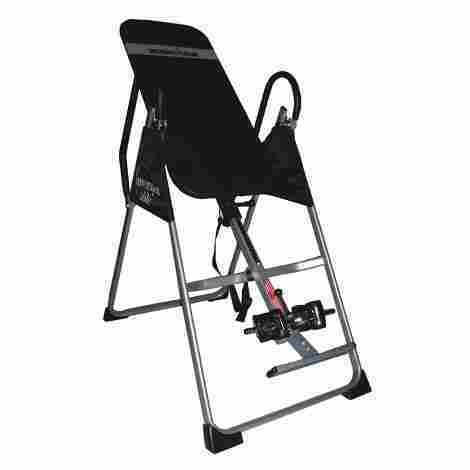 This inversion table avoids all the rough and painful pads and presses by using AirSoft technology. This means that the ankle holders fill with air to tune themselves to your personal ankle needs. The bar is often a place of joy, but in our case it’s a thing of safety. This is the bar that’s going to keep you from swinging out of control. As the write-up pointed out, most other tables use straps and holders to control the amount of inversion you get. Those can be faulty, and hard to set up. The bar makes it easy to set it and forget it, giving you peace of mind about how far back you’re going (and how quickly). There are two prices listed here, which make us raise an eyebrow. The company apparently sells the table both with the AirSoft supports as well as without it. The difference in price isn't huge, but it is enough to make us wonder if the table is worth it without the AirSoft mechanics. It’s a huge selling point of the table, and without it we think that it would probably end up being just another average inversion table. Our advice: spend a little extra money and get the table with the AirSoft supports, as it’s still going to come in under the average anyway. Are you a workout buff who’s looking for a little 6-in-1 action? 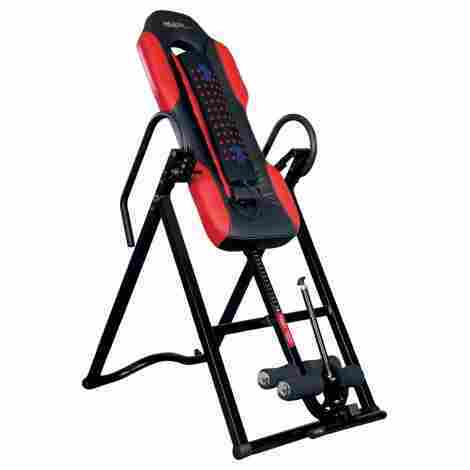 We’ve got you covered with this inversion table and home gym combo. The 6-in-1 means you’ll never need another full-body workout machine. Combined with the inversion table aspect, there’s never going to be another machine walking across the doorstep of your home. All you need is this one combination Power Tower. Seriously, we can’t stress this enough. Home gyms are incredibly useful on the quest to lose weight and improve your overall health. This is so similar to actually going to the gym that you might never renew that gym membership. Home gyms provide access to workout equipment any hour of the day or night. You don’t even need to get dressed to use one! Leaving the house? Never do it again by putting a home gym in your place. This home gym includes inversion table functionality, which is the real reason it’s on our list. The home gym aspect is awfully nice too, though. You might not be looking for this specific benefit in an inversion table when you start your search, but trust us: you’ll want it. For a table like this, which has the added benefit of being a home gym, washability is a must. You don’t want to leave old sweat on the machine, which will certainly build up and discolor over a long period of time. By adding washable arm pads Conquer has said “yes, you do deserve a clean health machine”. We think that’s great, as it will reduce germs and keep everything clean. 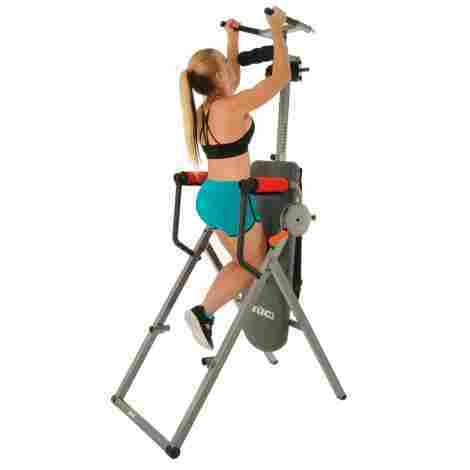 This inversion table and 6-in-1 home gym comes in at a very affordable price tag. We love the way this table flips and converts, and we believe that you’re definitely getting what you pay for with its total body fitness. This machine might be a little more expensive than either one is on its own, which means it’s a great deal altogether. If you’re ready to invest in your health, drop that gym membership you never use and purchase this machine. We’re quickly reaching the end of our list, but the rockstars of the inversion table world are still pouring in. This inversion table is definitely a great choice, especially if you’re looking to just sample what an inversion table can do. Let’s face it: inversion therapy isn’t for everyone, and some people really regret when they waste $400 on a table that does nothing for them. Don’t be afraid to pick up this table as a practice table, to get the hang of inversion therapy. You’ll likely find that you’re satisfied with the smooth shifting and sleek build, and might never go for the more expensive models again! When you’re a wide person, you want to be sure that the inversion table you buy is going to be wide enough to handle you. When flipping upside down, it’s important to feel supported and safe. If you’re worried about spilling over the edges, it’s not going to result in a positive user experience. This backrest is thick and wide, making for a comfortable and contained ride for any and all body shapes. This inversion table has a great sense of style, which is part of the reason we wanted to add it to our list. The look of a product is almost as important as the feel and purpose of it, as this inversion table exemplifies. The silver and gray color tones make it look a little more sultry than some of the other inversion tables. If you want to display this puppy, you can’t go wrong with an inversion table that looks like this. This inversion table is remarkably cheap, making it one that’s necessary for anyone who’s had any sort of lower back pain in their life. This table might not be the fanciest, but it will do what you need it to do. While we personally might be more inclined to spend a little extra to get all those maybe-unnecessary safety features, not everybody wants them. And that’s totally fair. This is the option for those that was a basic, no-frills inversion table. It might not last forever, but it’ll give you a good idea of what inversion therapy can do for you. Last but certainly not least, we have this inversion table with lumbar pillow. 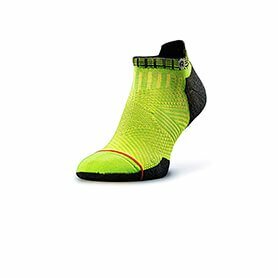 Fitness Reality makes your fitness dreams a reality with their Amazon products. Not only do they have a high standard of manufacturing, but they also have a solid track record in terms of ease of putting the product together. You really do want to be able to rest easy when you’re inverting, as the whole point is to relieve tension. If you’re just tensing up when you’re on the machine, you really can’t enjoy its full benefits. It’s because of this anxiety we all have that we decided to mention sturdiness as a positive quality. On this list, you’ll find many sturdy inversion tables, but none that are as rock solid as this one. Some tables don’t actually allow you to reach your full, upside-down potential. This table doesn't keep anything from you, though, as you can hang out at 180 degrees all you want with this product. The full vertical inversion shouldn't be attempted without warming up into it, and definitely not for a first-time inverter. Its capacity to go 180 degrees could be frightening for some, but we feel that it’s a nice product to grow into. It does include a safety strap to stop you from flipping upside down uncontrolled, though. We've seen inversion tables that are very expensive, and very average. This table is one of the cheapest ones on the list. We love it for that reason. It’s plain, it’s simple, and it’s just a good table. You’ll get everything you need out of this table, even if you don’t plan on keeping it forever. Inversion tables are a therapeutic tool that can change peoples’ lives. When used correctly they offer a huge amount of relief and relaxation, making these tempting for folks who have only just started learning about inversion therapy. While inversion tables aren’t for everyone, we hope we’ve helped you narrow down your search. Any of these 10 ten would be an excellent choice, and would help you on your path to health. Remember, though: get help setting them up, don’t flip fully too early, and use them like the tool they are. You’re sure to find one that suits your lifestyle, which we’re sure will become your most treasured toy yet. As a potential player in any of the personal or home gymnasium equipment parties, all of the important measures to consider when selecting a product, pale in comparison to ensuring that the build quality of your table is top tier. Most importantly, is the structure. You see, you’re going to be dangling with your head pointed towards the ground (not the way you’re naturally supposed to be pointing, by the way, just in case you needed that reassurance), so you must, and we mean must pick something built with strength in mind. While shopping, you’ve got a few things you should pay very close attention to. One of them being the weight load limit. Most of these options listed above and almost all of the decent options we looked at listed the load capacity in the product description. If it doesn’t, we’d suggest you be very cautious moving forward with picking it up. Other variables include the make and materials of the padding, or base of the inversion table. Which should be either cool air providing, and not solid, or be soft and pillow-like and preferably leather (which is one of the easier surfaces to clean. We made sure to include only products that have a base of structural integrity and quality build, plus anything in the form of flash or additions made of equally high quality. When it comes to inversion tables, you’d be surprised but, there isn’t a whole ton of variety. I know right. I hope you were sitting down before that truth bomb. Throughout our exhaustive search for the best available, we did manage to find a great list of different machines that all have some pretty great extra features. If you’re on the hunt for the perfect Inversion Table, it’s absolutely essential that you take the time to search through the different options available, because you might find the most suitable combination of additions in a single product. Here, we have selected a ton of different Inversion Tables that differ from one another in meaningful ways. It’s important when looking to purchase an inversion table, scratch that, it’s important to consider when shopping for almost anything to consider the widest possible price range that you can. For a lot of things, it’s key that you spend as much as you financially, and morally can support. Especially if that thing is technological. Manufacturers and designers are paid to be as creative within their means that they can be, and often this results in corners cut or things left out. The more you pay, the better quality everything will be. It’s an unfortunate product of how the consumer market works based on the needs for manufacturers and companies to make a profit, and also a fantastic result of a high consumer demand to have a fair margin for profit on most things. While there may not be a huge discrepancy between the prices of all of our listed products, there is enough of a gap between the top end and the bottom to supply you (and us in research) the best glimpse at what the array is on the market. Q: What is the tilt max? A: That is a fantastic question. One that we saw on a surprising amount of product sections. The answer should be completely upside down. The purpose of the Inversion Table is to eventually be able to handle an inversion of one hundred and eighty degrees. So if the table you’re looking at doesn’t seem to go all the way upside down, you’re going to want to look elsewhere. There’s nothing, and no reason to purchase an Inversion Table that doesn’t invert completely. Q: Will I be secured? A: It looks pretty extreme right, hanging complete inverted? I know what you’re saying, but hey random person on the internet with sensible levels of expertise on Inversion Tables, how do I know I’ll be safe? What keeps me on the table? Well! Most of the Inversion Tables on the market have (at the very least) a foot bar, and handlebars that you hook your feet around, and hold onto that will help keep you secure. Fancier tables might have straps or locks to keep both you in, and to keep your table at your desired angle. Q: Can I store this table? A: Many of the products we listed can be put together and used, but also folded up — not so flat, but far smaller than fully together — and stored away to clear the room. You may, however, find some of the options on the market don’t have the ability to fold up and store, meaning that you will need to consider having it fully erect at all times in your space. It’s important to take your available space into the equation once you begin shopping. Q: What is the height of this product? A: That is a very good question, but the answer differs quite a bit between the products listed here, and products throughout the market. Many tables have fixed heights. You’re going to be — if the product is a fixed height product — looking at a list of tables that will range between six feet and seven feet max. But there are some perks to the high end of the price scale when it comes to Inversion Tables. Many of the premium tables on our list have built-in height adjustments. These might range from fitting people from five feet tall all the way up to seven feet tall. All on the same machine. Mayo Clinic, Inversion therapy: Can it relieve back pain?